For over 40 years, Gurutej Kaur has been teaching people in the US, Canada and Europe how to connect to their higher consciousness through Kundalini Yoga, chanting, meditation and healing. She specializes in pre and postnatal yoga, and yoga for women and children. 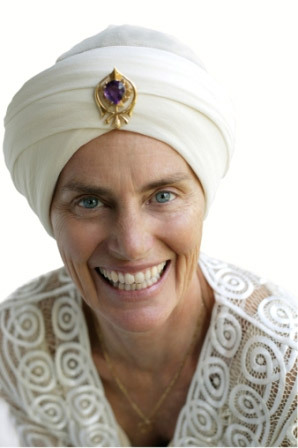 In 1998, along with Gurmukh, she founded the Golden Bridge Yoga Center in Los Angeles. Every day she lives the meaning of her Sikh name, which translates as "the one who brings you from darkness into light." In 1969 Gurutej met Yogi Bhajan, the great guru credited with bringing the secrets of Kundalini Yoga to the United States. It was Yogi Bhajan’s aim to offer instruction and spiritual guidance to aspiring teachers in order to spread this technology, and Gurutej emerged as one of his first graduates. She is now considered a foremost authority and internationally recognized as one of a handful of Kundalini Yoga Masters. She has released a number of very popular and successful instructional Kundalini Yoga DVDs – Kundalini Yoga for Balanced Chakras, Kundalini Yoga for the Immune System, Kundalini Yoga for Mental Clarity and Awakening Intuition for Women. She knew from a very early age that her destiny lay in leading others to greatness. She told her mother just that when a six-year-old. Creative, a born leader and free spirited thinker, she is also direct, funny and full of mischief, with bright blue eyes and a wicked smile! In 1970, Gurutej co-founded 3HO Canada. There she ran 3HO for 17 years, facilitating its grown and opening successful yoga centers throughout the country. In due course she did much to help spread the teachings to a waiting world-wide audience. Her obvious head for business did not overshadow her commitment to the children of Toronto. She introduced Kundalini Yoga to surrounding communities by teaching staff at Toronto General Hospital and students at The School House and The Alternative Schools. Gurutej, has lived and practiced out of The Blessings Center in Los Angeles since 1999. She feels that her greatest achievement has been in the successful raising of two dynamic and consciously aware adult children, who, like their mother, take great pride in their commitment to making the world a better place. She is also an artist, exhibiting her first gallery showing for her paintings and mixed media in May 2003. Her book for couples - “A Slice of the Beloved” - published in 2008, details the connection between Kundalini Yoga and the successful building of intimate relationships, and is lavishly illustrated with some of her own original work. A prolific writer and media contributor, Gurutej Kaur is the subject of much media attention. She has been featured in/on Vogue, L.A. Yoga, Yogi Times, Fit Yoga, Common Ground, Splendora.com, The Discovery Channel and MTV. She was awarded Yogi Times' July 2003 Service Award and Teacher of the Month for August 2003.